Bam Thwok - The Chip's Challenge Wiki - The Chip's Challenge Database that anyone can edit! Never allow the tank to be switched. Every block adjacent to a blue button has a blue button underneath. Bam Thwok is the 130th level in Chip's Challenge Level Pack 4. It was created by Tyler Sontag. This level was busted in its original level set, TS2. 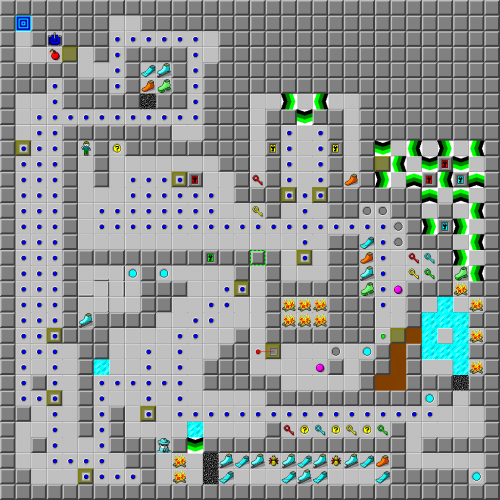 The bottom section originally contained suction boots, and due to boosting off the ice patch above that section in the MS ruleset, one could press two tank buttons consecutively without needing to use the block. The suction boots were changed to ice skates to disallow escape from the bottom room with suction boots, but this was discovered to also bust the level after CCLP4's release. The player can grab ice skates from the bottom section after they obtained the suction boots from the top-right section, avoiding the partial posting puzzle.